Trans-Miss. set complete, bicolor essay, die with black vignette on India, die sunk on full card (201 x 152mm), the complete set of nine "normal" bicolors, rich intense colors, each card fresh and free from usual toning or other small flaws associated with these full card essays, Extremely Fine and choice, one of the finest sets we have ever encountered. A REMARKABLE SUPERB SET OF THE 1898 TRANS MISSISSIPPI BICOLOR ESSAYS. 1898, 2¢ Trans-Miss., rich vibrant color and attractively centered, tied by neat "Washington, D.C., Jun 17, 98" First Day of Issue machine cancel on cover to Columbus, O. receiving backstamp, Very Fine and attractive, illustrated in Neil & Rosenthal The Trans-Mississippi Issue of 1898 (pg 63); with 1995 P.F. certificate. Scott No. 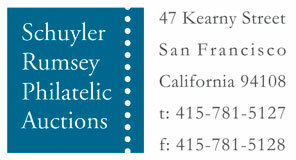 286; $8,000 Estimate $3,000 - 4,000. 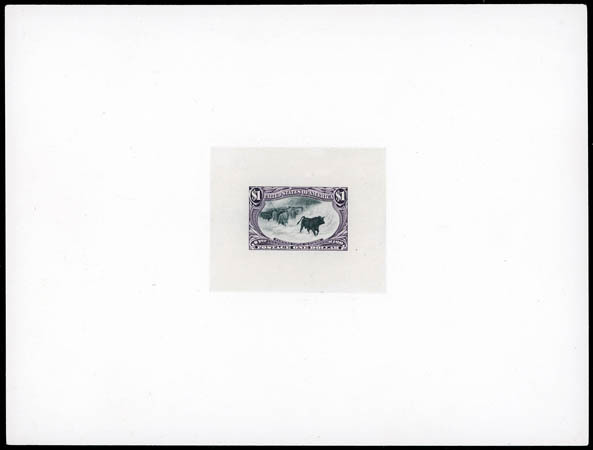 A VERY RARE 2¢ TRANS-MISSISSIPPI FIRST DAY OF ISSUE COVER. Henry Scheuer has estimated that approximately twelve to twenty 2¢ Trans-Mississippi First Day Covers are known, plus an additional three covers with the 2¢ used with other denominations. A previous owner once had included a note reading…"In 1994 I found this cover in a shoe box of old covers all addressed to or from Otto Kemmler. With this cover, folded to fit inside the cover was the P.O. 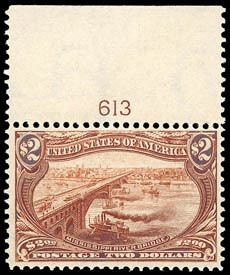 Announcement about the release of the Trans-Mississippi Stamps. 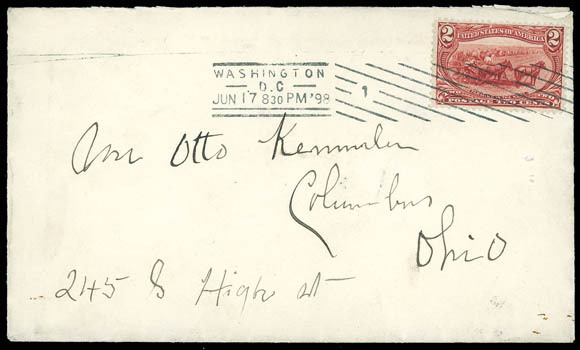 I believe this cover was used by the PO to mail a set of Trans-M. stamps (see manuscript marks on reverse of stamps types) of envelope to Mr. Kemmler and the announcement was used to protect the stamps inside the envelope.". 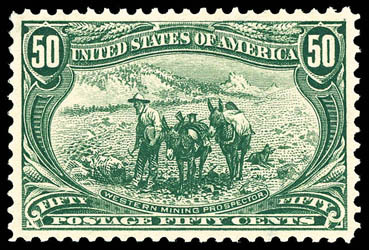 1898, 50¢ Trans-Miss., o.g., very lightly hinged, deep intense color, perfectly centered within well balanced margins, exceptional freshness, Extremely Fine to Superb, a gorgeous gem stamp; with 2015 P.F. Graded certificate (XF-S 95, SSV $1,450). A VERY SCARCE EXAMPLE OF THE 50¢ TRANS-MISSISSIPPI ISSUE IN OUTSTANDING CONDITION. 1898, $1 Trans-Miss., neat complimentary target cancellation, exceptional centering amid large beautifully balanced margins, rich intense color enhancing a detailed proof-like impression, Extremely Fine to Superb, one of seven examples to receive this lofty grade and only three graded higher; with 2015 P.S.E. Graded certificate (XF-Sup 95, SMQ $3,900). 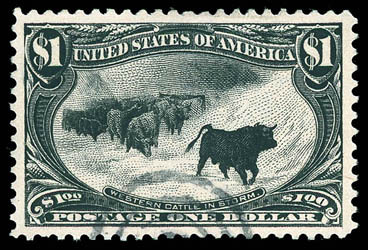 A REMARKABLE USED GEM EXAMPLE OF THE $1 CATTLE IN THE STORM ISSUE. 1898, $2 Trans-Miss., top right plate "613" number single, Post Office fresh o.g., barest trace of hinging, rich intense color and remarkably fresh, Very Fine to Extremely Fine, a handsome mint high value; with 2015 P.F. certificate.